Permanent markers, glue sticks, and packing tape may make soft and ductile, or so-called “gummy” metals easier to cut, according to new research. What makes inks and adhesives effective isn’t their chemical content, but their stickiness to the surface of any gummy metal such as nickel, aluminum, stainless steels, or copper, researchers found. These adhesives help achieve a smoother, cleaner, and faster cut than current machining processes, impacting applications such as the manufacturing of orthopedic implants, surgical instruments, and aerospace components. “A wide range of products rely on the machining of gummy metals. These could be something we use every day, such as the valve in a sink faucet, or something more critical like a compressor part in the jet engine of an airplane,” says James Mann, an assistant professor of mechanical engineering at the University of West Florida. If a significant improvement can be made to the “machinability” of gummy metals or alloys—which is how well they cut, drill, or grind—then there is potential to lower the cost of products, improve their performance, or enable new and improved designs. Getting rid of the wiggles means that the metal now tends to act more like a brittle ceramic or glass in the spot where it needs to be cut. One well-known way to make the gummy metal brittle is by coating it with a suitable liquid metal, such as gallium in the case of aluminum. Liquid metals like these, however, tend to work too well; diffusing through the surface and causing the whole metal to crumble into a powder. “This makes the metal being machined unusable,” Chandrasekar says. Other attempts that met with limited success tended to be either toxic or resulted in tears and cracks on the machined surface. The researchers then began to explore other benign chemical media that would cut cleaner. 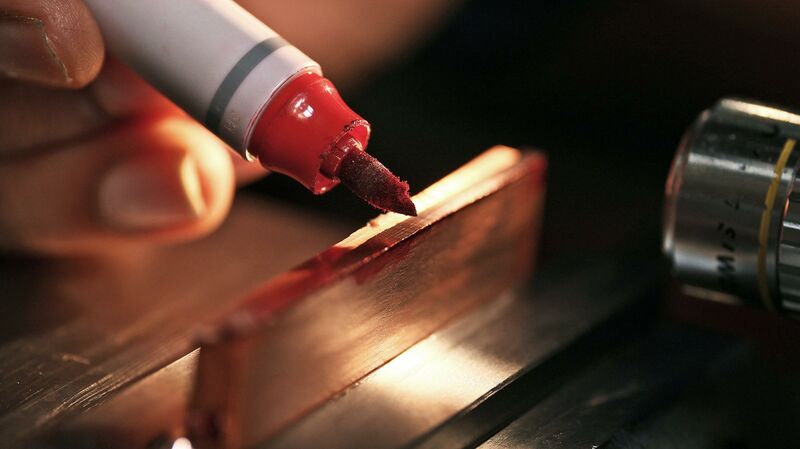 Marking with ink or attaching any adhesive on the metal’s surface dramatically reduced the force of cutting without the whole metal falling apart, leaving a clean cut in seconds. The quality of the machined surface also greatly improved. Stickiness didn’t initially stand out as a solution that permanent markers, glue sticks, and tape have in common. The Sharpie and adhesives also appear to work on many gummy metals, regardless of the cutting tool. To the researchers’ knowledge, using permanent markers, glues, or tape to make gummy metals easier to machine does not pose any environmental hazards. Next, Chandrasekar’s group will be assessing the degree of stickiness that works best for cutting gummy metals and exploring ways to advance the application of this technology into industrial practice. The US Army Research Office, the National Science Foundation, and the US Department of Energy funded the work.